This is my assignment with the Secret Recipe Club.The aim of the club is that you are allocated a blog from which you have to select a recipe and try it and blog about it. For the month of September my assigned blog is Picnic written by Nicole who is a neuroscience researcher and is a keen photographer. Looking through her log was fun and I really liked the garlic naan bread recipe which I have selected for the secret club challenge. The recipe turned out perfect. 1. In a large jug combine 1 teaspoon sugar, yeast and warm milk and leave to one side for yeast to activate.2. Sift the flour, baking powder, salt and sugar into a large bowl.Add the chopped garlic and and stir it through the flour.3.Add the yoghurt and oil to the activated yeast and mix together.4. Add the wet ingredients to the dry ingredients in the bowl a little at a time until the flour comes together. Once a soft dough is formed, transfer the dough to a floured tabletop and knead the dough.5. Place the dough in a bowl and oil it slightly.Cover the bowl with cling film and leave the dough to prove in a warm place for two hours.6. After two hours, remove the dough from the bowl and knead again. Divide the dough into 6 portions.7. Roll each portion into a long oblong shape naan.8. Place a large griddle or frying pan on the heat. Brush the underside of the naan with water and place it on the griddle. Cook the naan until small bubbles appear. Flip the naan over and cook the top side for 1-2 minutes. 9. Remove naan from pan and keep it wrapped in tea towel to keep it warm and soft and repeat process for remaining dough.10. 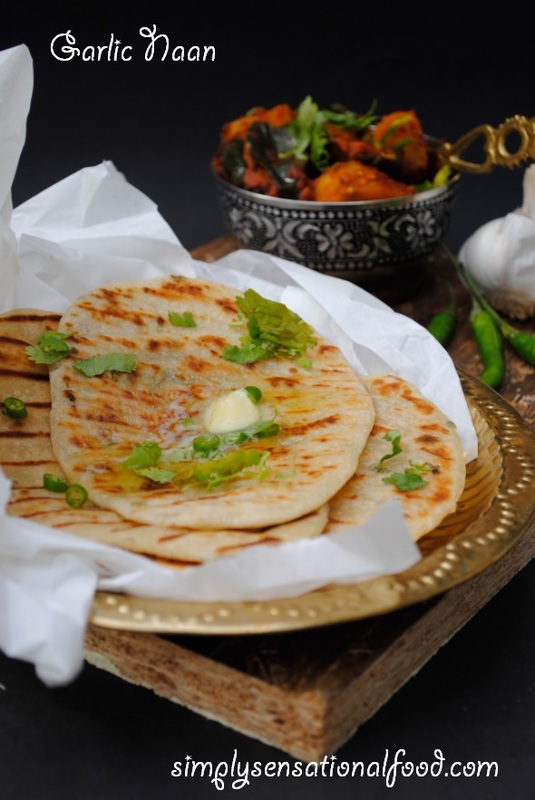 Before serving drop a dollop of butter onto each naan bread and sprinkle with chopped chillies and chopped coriander. Never had much success making Naan Bread so will be giving this a try. Your naan bread turned out absolutely wonderful :) I am so happy that you enjoyed the recipe! That looks like really delicious naan! I LOVE naan bread...mmmm homemade is the best and this looks perfect! I've never made this but love to eat it!! This looks amazing! So glad it turned out so well! Oh my, they look wonderful! I didn't have much success when I tried making naan in the past. Yours looks like it turned out perfectly, I may have to try my hand at making it again. I LOVE garlic naan. I so have to try and make this, thank you for the recipe! Oh I love naan bread! I'm lactose intolerant so I might try this with dairy free alternatives! Making butter chicken this wknd and this naan would be perfect with it. Especially with all the garlic!! YUM. Love garlic naan, so beautifully made and looks delicious. Naans are perfect to serve with shahi dishes.. Love the ones with garlic flavour. that naan looks wonderful! lovely choice for src! I've always wondered how to cook Naans! Will definitely be trying this one out! These look absolutely delicious - that melting butter! Yum!